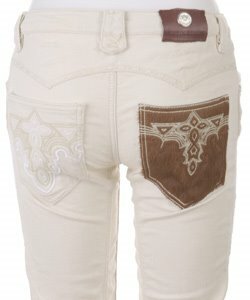 Check out these Antik Denim 5-pocket Western Pony Pocket Jeans. Embroidered accents, real pony hair pocket and a rich cream finish embody the latest fashion trends, making these Antik denim jeans a chic addition to your wardrobe. Get these gorgeous jeans and more at a fraction of the retail price at Honey Jeans New York. Looking for that perfect, versatile, designer top? This high fashion tunic by BCBG TO THE MAX features chiffon fabric in a low-cut tunic. Shimmering sequins add a stylish touch. Pair it with jeans and casual shoes for a fabulous daytime look or step up the volume with striking makeup and heels for the evening. One thing's for sure, you will be a fashion "Do" no matter what in this fabulous top from BCBG. Craving more savings? Well don't forget to use the advertised coupon code on the Honey Jeans New York website to attract an additional 10% off every order at checkout. For all you internationals, the good news is that as well shipping anywhere in the continental United States, Honey Jeans New York do ship internationally. The tunic is definately a must have!